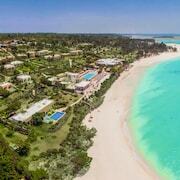 What are the top landmarks in Zanzibar? Enjoy a beautiful stretch of white sand and blue sea surrounded by plenty of amenities, as well as a turtle conservation site. Cycle like a local, go snorkeling near rocky outcrops and beachcomb through the seaweed harvest along this secluded haven of tranquility. Nothing says holiday like spending a lazy day at Kiwengwa Beach, a popular beach in Kiwengwa. Stroll along the seaside or experience the area's entertainment choices. Nothing says holiday like spending a lazy day at Shangani Beach, a popular beach in Zanzibar Town. While in this walkable area, you can savour the top-notch restaurants. 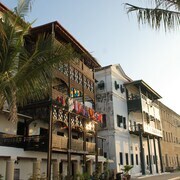 Stone Town is an historic, walkable neighbourhood with convenient options for restaurants. The neighbourhood has many appealing features, among them its rich culture. For a taste of local culture, you can visit the shopping and live music. 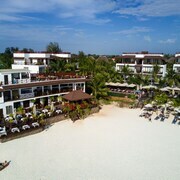 Situated in Nungwi, this beach resort is steps away from Nungwi Natural Aquarium and Nungwi Beach. Kendwa Beach is 1.9 mi (3.1 km) away. Nestled on the beach, this Kiwengwa hotel is 0.6 mi (0.9 km) from Mapenzi Beach and 1 mi (1.6 km) from Kiwengwa Beach. Muyuni Beach is 3.8 mi (6.2 km) away. Life in Zanzibar cannot be captured with words. Scents of nutmeg, cloves, and cinnamon fill the air in areas where spices are packed to be sent all over the world. Rare monkeys and exotic leopards roam the lush forests that frame the breathtaking beaches here. So many worlds and cultures collide beautifully in this enchanted place. Ports and outdoor markets create a lively atmosphere of trade and community. 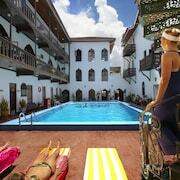 The most famous annual event that takes place here is the Zanzibar International Film Festival. 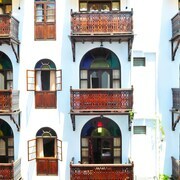 Colours, scents, flavours, and endless layers of history will be waiting for you outside your Zanzibar hotel. If you’re looking for a destination you can visit any time of year, you’re in luck. Zanzibar maintains a consistent climate throughout the year. High heat is often cooled by powerful sea breezes from the Indian Ocean. Temperatures stay between 22 degrees Celsius and 32 degrees Celsius all year. Year-round warm temperatures are one of the reasons why luxury hotels in Zanzibar attract sophisticated visitors from around the globe. Your time in Zanzibar can be whatever you make of it. 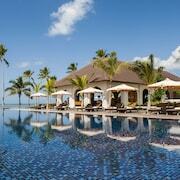 Many people choose to relax in the lap of luxury by staying at hotels on the beach. Others choose to enjoy boutique hotels with access to public squares, archeological treats, and sprawling markets. Are you looking for great outdoor attractions? We recommend making time for Nakupenda Beach, Paje Beach, the Zanzibar Land Animal Park, the Nungwi Natural Aquarium, and Jozani Chwaka Bay National Park. Become immersed in local history and culture at the Mtoni Palace Ruins, Stone Town, the Palace Museum, and the Hamamni Persian Baths. Are you ready to explore the treasures of a destination that has endured through the ages? It’s time to plan your holiday to Zanzibar. You’re about to discover that getting the guaranteed best rates around at hotels near the globe’s top attractions can be easy. Use our online travel tools to explore all-inclusive packages that feature Zanzibar flights and rooms at incredible hotels. Our cheap rates are designed to make a global adventure affordable on any budget. 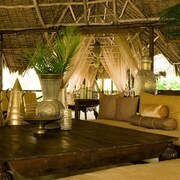 Discover a world of amazing prices at hotels in Zanzibar here on Expedia.co.uk right now. Explore Zanzibar with Expedia's Travel Guides to find the best flights, cars, holiday packages and more!